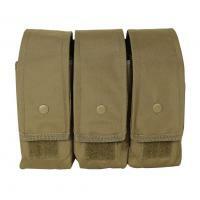 Carry all spare magazines needed to get the job done with Voodoo Tactical's M4/AK47 Triple Magazine Pouch. Built for versatility, the ammunition carrier holds multiple sizes of magazines to fit the needs of any tactical professional. Three individual pouches offer secure storage of up to nine, full-size M4 30-round magazines, or six AK47 30-round magazines. Fully adjustable hook-n-loop closures provide reliable magazine retention, regardless of height, while adjusting snap fixtures offer additional retention power. Metal grommets provide drainage, preventing rust and corrosion from effecting magazine function. MOLLE-compatible universal straps offer secure attachment to duty vests, range bags, belts or any other webbed platform. Ok mag pouches for a split purpose.